If you can think it, you can Cri-cut! 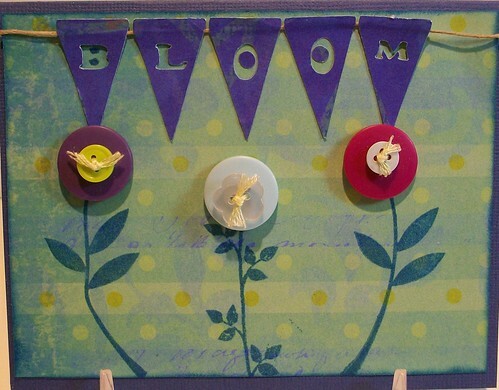 What: This event is a fun weekend that will combine scrapping with your Cricut, meeting new friends, and a chance to win lots of cash and prizes. During the day, there will be classes, plenty of scrap time, as well as food and refreshments. Beginning at 6pm on Friday and Saturday nights, it’s time to play bingo. 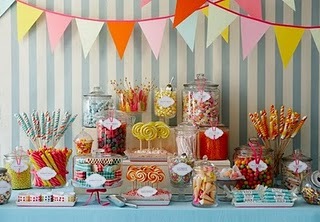 After the bingo game, we’ll have more snacks and cropping until the wee hours. Where: The crop will be held at a local Bingo Hall in Columbus, located at 3080 Westerville Rd. Who: The crop is being run by Margie Hunter and Kathleen Leanna. 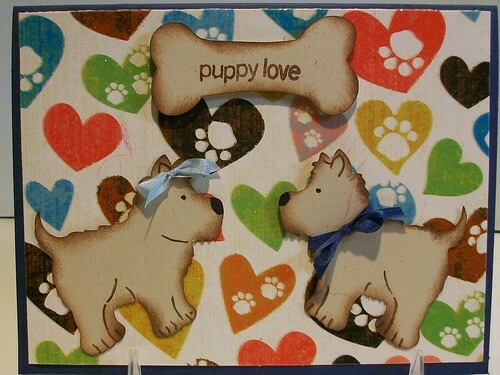 Margie has many years of scrapping experience, particularly in the area of Cricut and Close to My Heart Products. She will be available the entire weekend to help you with any and all Cricut or other scrapping problems, answer questions, or just provide a helping hand. She will teach one class using the Cricut. The other class will be taught by Kathleen Leanna. 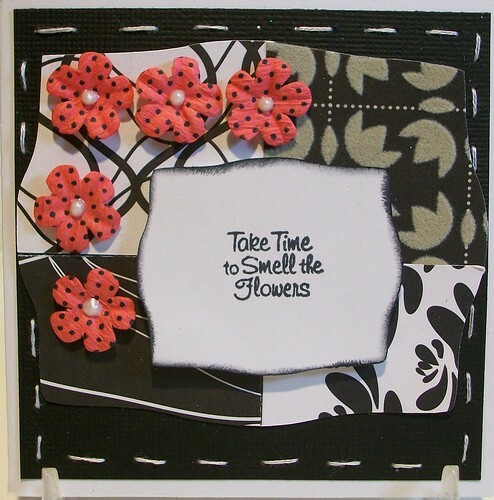 Kathleen has been paper crafting for 25 years she is an avid follower of all things Tim Holtz, and has attended both his online and live classes. 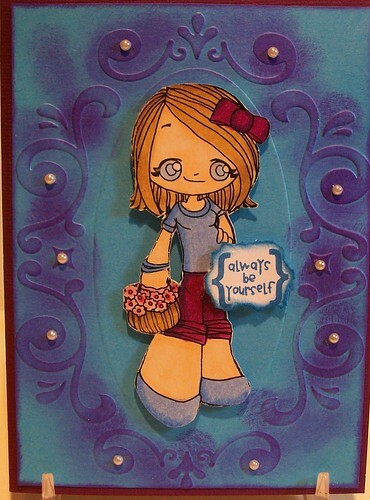 She enjoys all aspects of paper crafting, from mixed media art and fibers to jewelry. She will be teaching a technique class and will be on hand to help all weekend. Cost: $150 per person, with a $25 non-refundable deposit to secure your spot. The remaining balance is due by Friday, September 7. You can pay by check, money order, Paypal, or credit card. For more information or to make a deposit, please email Margie at margie@createyourheartout.com. Space is limited, so make your reservation today! Cricut and Close to My Heart are at it Again! Yes, you heard that right. Due to the success of the first Cricut and Close to My Heart collaboration, there is now another. This time it’s the Cricut Artiste Cartridge Collection, and it will be available on 8/1. 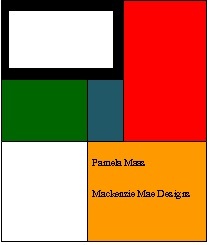 Included in the collection are 3 coordinating My Acrylix D Size stamps and 3 coordinating 9×12 dimensional element sheets. Retail price is $99, but right now you can get the collection from me at 22 percent off, which brings your total to $92.39. Check out the images here. 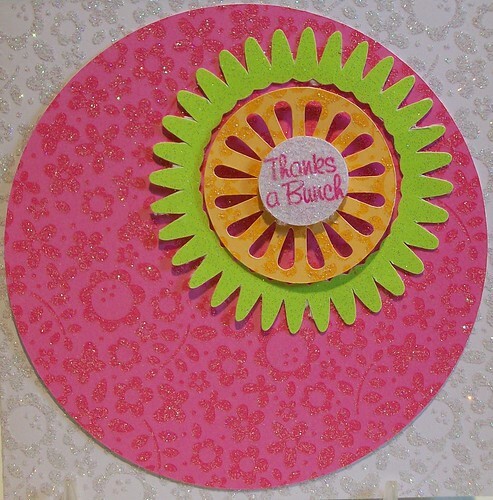 For an extra $5, you can get the August Stamp of the Month, Baroque Borders, bringing your total to 98.07. 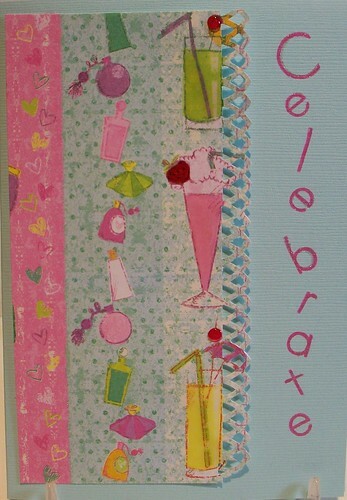 On August 15, you can add the National Scrapbooking Day Double Stamp for $5. This is a limited edition stamp that is only available 8/15 thru 9/30. If you want the Cricut Artiste Bundle, the August Stamp of the month and the NSD double stamp (not available until 8/15), your total will be $104. That includes tax and shipping. What if you can’t wait to get the bundle, but you still want the NSD stamp? Talk to me. We can work something out. If you can think it…you can Cri-cut! 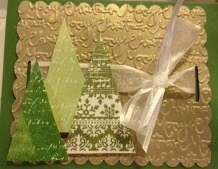 The holidays are here, and for many crafters, now is the time to start making holiday cards! Close to my heart has a great deal this month. When you spend $25 on My Acrylix stamp sets between now and November 30, you can get a D-size Holiday Wishes stamp set for only $5. You can get one for each $25. Many of the images on the set go perfectly with the Cricut Art Philosophy cartridge for even more fun! Of course you can also get the stamp of the month when you spend $50, and this month is Cherish the Day, yours for only $5 with any $50 purchase. So if you spend $50 this month, you can get two holiday wish sets and one stamp of the month! For more information or to place an order, just contact me and I’ll be happy to help you out. The holidays are almost here! If you’re looking for something to make your Christmas cards with, then this Stamp Of The Month is a great deal. 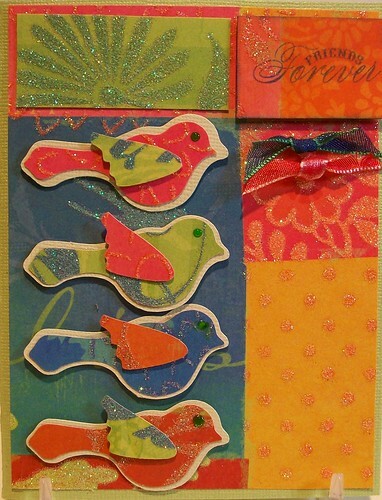 Only $5 with any $50 Close to My Heart purchase, you can make fabulous cards everyone will love. 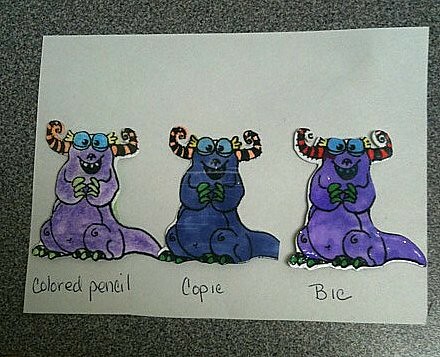 An Exciting Close to My Heart/Cricut Deal! I’ve got a great Close to My Heart offer I’d like to share with you. For a limited time, anyone who makes a $100 CTMH purchase through me will receive either your choice of a Cricut cartridge (see choices below) or a $20 JoAnn’s gift card. Once they’re gone, they’re gone so if there’s a certain one you want, you better act fast! For those of you who still don’t have your Art Philosophy cartridge, this is a great opportunity to score a deal! This offer is only for a limited time, and is only valid for purchases of $100 in product before sales tax and shipping are added. To place an order, or if you have any questions, send me a message through here. Also don’t forget about the Stamp of the Month for only $5! This month’s is Holiday Magic, just in time for your holiday cards. Contact me to place orders, or for more information. 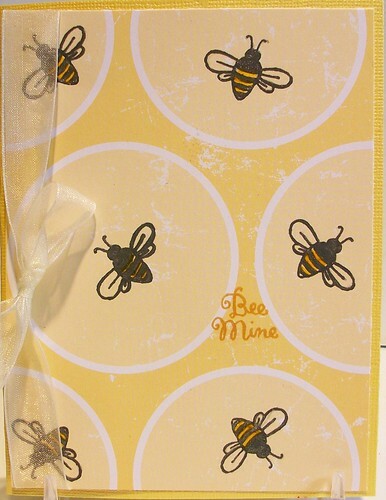 Cricut/Close to My Heart Collaboration Deal! Act NOW! With the exciting news of the Cricut and Close to My Heart cartridge collaboration, I have got some news and special offers of my own to share with you. This deal runs between August 15-31, so get this deal while you can! 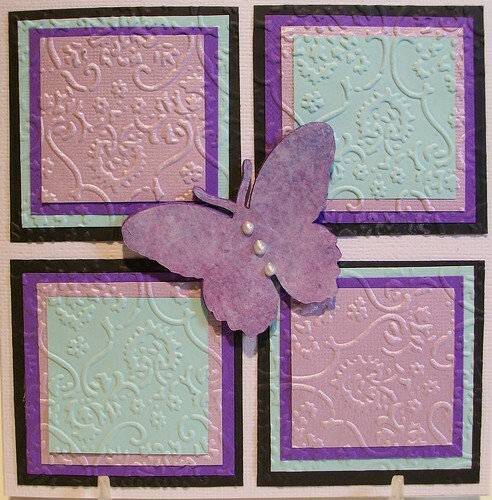 If you purchase the Cricut/CTMH cartridge, you’ll receive 2 extra paraphrase stamps. For another $5, you can get the Stamp of the Month, and a BONUS stamp. That’s a total of FOUR stamps. And on top of that, I personally am giving you a 20% discount. So what does this mean? It means you can get the cartridge and 7 sets of stamps for $108.20 You will not find this deal anywhere else, so plan ahead and don’t miss out! Remember this deal is only available during those two weeks, so mark your calendar and grab yourself a great deal! One more thing: Close to My Heart charges shipping and tax, which will be added to your total. I will go over the charges in detail to those who are interested, but I just wanted you to be aware. If you would like to purchase anything else along with this cartridge, you can have an additional 20% off of your purchase, but remember this deal is only good for the weeks of 8/15-08/30, so be sure to take a look now and see what you want so you can place your order. 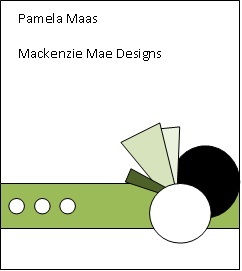 http://margiehunter.myctmh.com/ to see catalog. Remember you need to contact me at margiehunter.myctmh@gmail.com for all orders for the discount. There is no doubt that the recent events in Japan have devastated our people, our country, and our world. It is even more upsetting when you have family or loved ones that you can’t get ahold of in such a tragedy. I want to thank those of you who called, emailed, or otherwise expressed concern for my relatives in Japan. Thankfully, they have all been accounted for and are doing okay. Others however are not, and it will be a long time, if ever, before things will go back to normal for many, many people. If you would like to help, even in a small way, one of the companies I am affiliated with, Close to My Heart has created a stamp specifically for this purpose. The cost is $5, and 100% of the money collected will be donated to the Red Cross for use in earthquake/tsunami relief efforts in Japan. Buy 1 or buy 100, but know that it’s for a good cause. Most importantly in times like these, we should all take minute and be thankful for what we have because you never know when you’re life will be changed forever. 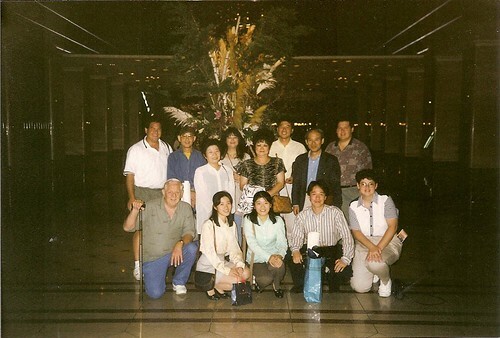 Below is a photo of my brothers, sister and I with our Japanese relatives on my first visit to Japan in 1997. Go to my Close To My Heart page for more information or contact me through this site if you have questions. 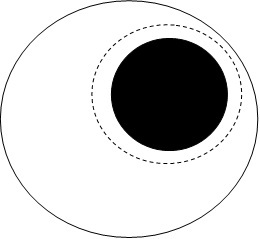 Please don’t leave a comment with a question regarding this matter, as I might not see it right away. Thanks again for everyone’s efforts. Before I get to my review, I want you all to know what I’ve been up to lately in case you have tried to get ahold of me to no avail. I have been working two jobs, one at my local scrapbooking store and then nights at another place. So my days don’t end until well past midnight sometimes. 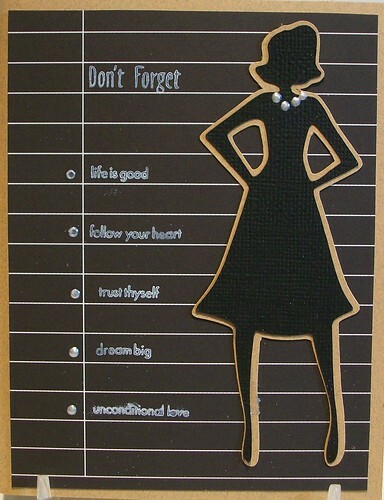 This is in addition to teaching and traveling and having my mother move in since my father passed away. So if have emailed, called or contacted me here and haven’t heard back, rest assured I am not ignoring you, and you will hear from me soon. Now on to what you came here for! Those who know me know that I am a huge fan of Copic Markers and am even certified to teach them. While I do still like them, I have to say, I have found a rival. With none other than the trusty maker of ball point pens you all know and love: BIC. 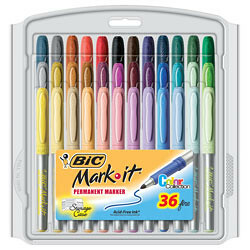 Bic makes these markers called Mark It Permanent Markers. There are 36 colors and they are smooth and vibrant and at less than 20 bucks for a set of 36, not a bad price. They come in fine and ultra fine and are perfect for crafting. If you look at the picture below, you’ll see the difference between a colored pencil on the left, a Copic marker in the center and the Bic on the right. The colored pencil (which I admit might not be the best comparison) is kind of faded and washed out. The Copic is a deep purple and the Bic is bright and vibrant. I used these in on of my classes and my students absolutely loved them. Especially those who are on a fixed income and would love to have some Copics but can’t afford them, these are a great alternative. All in all, these are great markers. I wish that they were double tipped so that I had a fine point on one side, but they are really pretty great. If you are in the mark-it (pun intended) for new markers, I highly recommend this set, you won’t be disappointed. If you’ve noticed I’ve been absent from the crafting world lately, you are correct. I will be back soon, but would like to share some sad news. 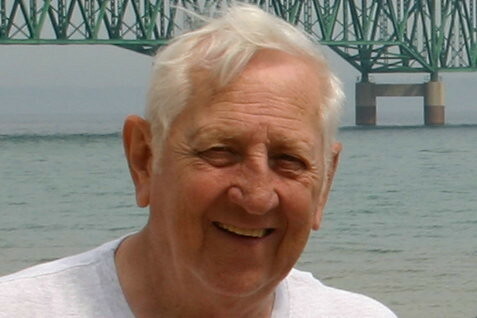 My father, Joseph Monahan, passed away suddenly last week in his home in Cincinnati. Luckily he did not suffer, but he will be greatly missed by all who knew him. I rushed to Cincinnati when I heard the news and have been here with my mother ever since. This past week has been about family, and while it was much needed, I wish that the circumstances were different. If you have called or emailed me about a crafting issue and I have not called you back, please know that I will get back to everyone as soon as possible. If you have called to express your condolences, I am grateful and will get back to you as soon as I am home and things are back to normal, which will probably be early next week. Thank you for all the kind words, cards and flowers. It is nice to know at times like these that I have the support of many great friends. If I have learned anything from this it is that life is indeed too short and cherish those close to you, as you never know how much longer you have with them. Wow! I never though I would get caught up. I’ve been in Washington D.C. with CTMH for the past week and met lots of wonderful CTMH consultants and have learned so much. And now I getting ready to leave for a Caribbean Cruise for a week so I’ll be catching up when I get home. Because I got so far behind and don’t want to miss a challenge at 365 Card Challenge I’m going to be listing my cards without individual information. If you need information on any of the products I’ve used send me an e-mail and I’ll get back with you. Day 138 is “Create Your Own” From the list you need to choose your own item, technique, pattern from each of the list. Day 137 is “Hot & Cold” For this challenge split your card in half based on color groups hot,cold, warm & cool whatever they’re called and there should be a distinct separation between the two. Anything else goes. Day 136 is “Imagine This Chalkboard” With an imagine this challenge all you have to do is be inspired by the item listed….in this case a chalkboard. Day 131 is “Beautiful Banner”. 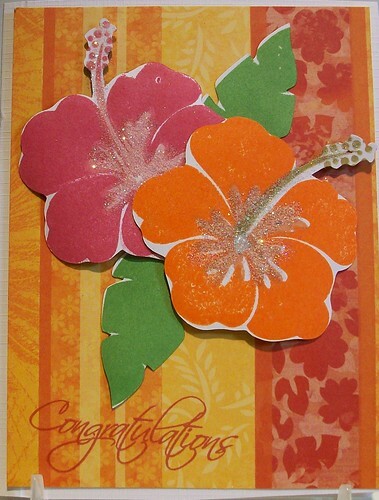 The challenge is to create a banner on your card. Day 129 is Aged Looked. You need to give your card the aged look. Day 127 is Old, New Borrowed, Blue. 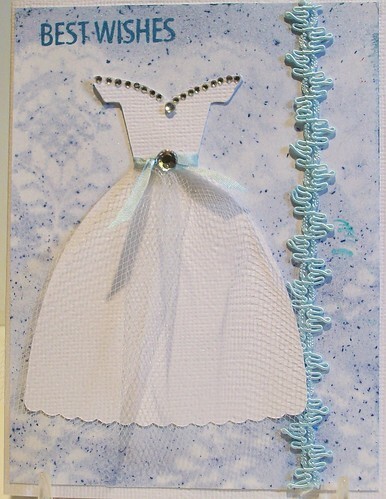 The challenge is to make a card including something old, something new, something borrowed, & something blue. 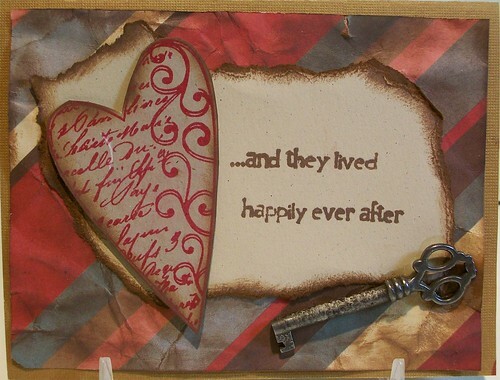 You don’t have to make it a wedding themed card just let the words inspire you. 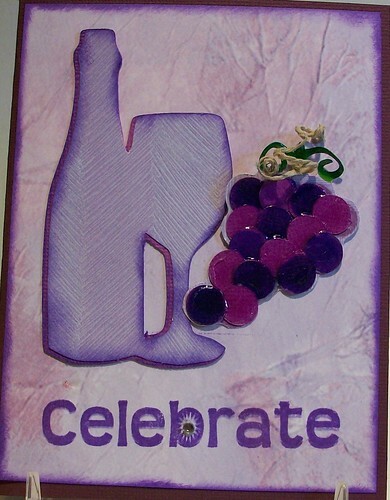 Today’s challenge at 365 Card Challenge is “Super Sketchy Sunday” I was invited to be a guest designer this week. 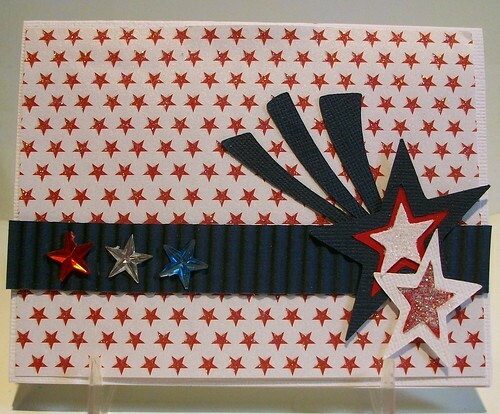 With today being my 36th Wedding Anniversary I thought a red, white and blue patriotic card would be appropriate. The stars bursting is exactly how I feel when I think of my wonderful husband Bob who I’ve spent the last 36 years married to. Happy Anniversary honey! 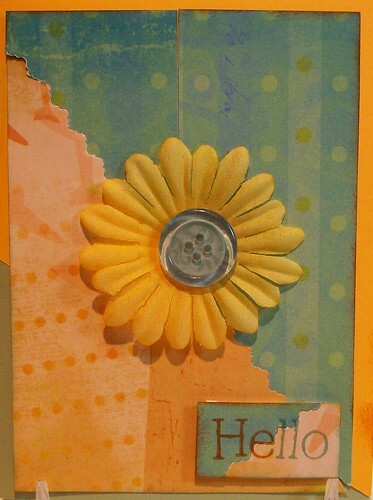 Day 123 at 365 Card Challenge is “Shades of Yellow” The challenge is to use three shades of yellow on your card. 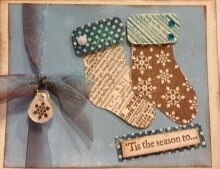 Day 122 at 365 Card Challenge is “Shades of Blue” The challenge is to use three shades of blue on your card.